RoboFly uses lasers to power its flapping wings. Like an umbrella with a hole in it, you can’t do a whole lot with flying insect robots tethered to power sources. Tiny airborne robots can sneak into hard-to-reach places that larger drones can’t, accomplishing some of the same goals, like surveillance and detecting trace chemicals like methane in the air. But they can’t do that if they’ve got big old cords sticking out of them. Over at the University of Washington, mechanical engineers are fixing that problem. They’ve invented RoboFly, the first wireless robot insect. By cutting the cord, robot flies are one wing flap closer to navigating the heights and narrow crevices that their living counterparts can. The researchers will present their work at the International Conference on Robotics and Automation on May 23, according to a press release from the university. The biggest hurdle for making cordless tiny robots was figuring out how to store the power that keeps them aloft. Flapping takes a lot of energy, so the equipment needed to hold enough power on minuscule devices would be so big that there would be no point in having such a tiny bot at all. So the RoboFly traded a cable for a laser beam. Laser power constantly feeds energy to the robot from far away, so there’s no wire and no bulky battery. RoboFly’s back has a solar cell that, when hit with a laser, converts light to electricity. Then, a circuit amps the power up to 240 volts — enough for flight. That same circuit also holds a basic computer called a microcontroller. This command center sends the voltage out in waves that stimulate different flapping speeds. Together, the solar cell, circuit, and metal fly body weigh about as much as a toothpick. For right now, RoboFly is able to navigate about as well as a toothpick, too. The robot can only take off and land because its controlling laser doesn’t move around. When the power source becomes more mobile, so will RoboFly. 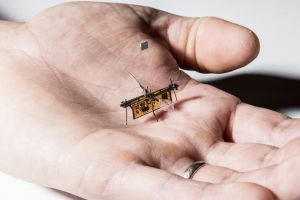 The laser could be dropped all together if power storage gets lighter — and then the robofly could go anywhere, even places that lasers might not reach (like inside structures). Once this metal insect is zooming independently, the researchers hope to give RoboFly the same insane sense of smell as the real guys. Living flies can sense the antioxidants coming from your rotting fruit and even distinguish between two types of hydrogen. Picking up on the same variety of substances as a real fly might be hard, but small, single-chemical detectors, like the methane reader IBM designed, might wind up on RoboFly’s back. The bug could then navigate tight spaces and pick up small and hard-to-reach methane leaks. And honestly, doesn’t that sound a lot more useful than the ones buzzing around your kitchen? Just remember not to smack this one with a fly swatter. That’s some meticulous engineering right there.